It’s the happiest place on earth! Children and Super Bowl-winning quarterbacks can’t get enough of it. We’re talking about Walt Disney World. Disney World is popular for tourists from around the world and RVers as well. Whether you’ve been here before, going for another trip, or want to take a unique family vacation in your recreational vehicle, Disney World is an experience you’ll never forget. Let’s look at some of the benefits of RVing to Disney and some tips and tricks for taking this trip with your family. Disney World is set in the heart of Central Florida in Lake Buena Vista, so unlike navigating through long, boring highways or National Parks, driving to Disney World is not too much of a hassle. The key is to avoid being stuck in the traffic of Interstate 75 south. If it is possible, make your final driving day during the week, not on holidays, and during the night. Electing to hit the road past rush hour can save you gas, time, and frustration. While Disney World is the end game, consider what you’ll see on the journey there. Plan a route that allows you to see what’s along the way and enjoy everything Florida and the surrounding states have to offer. Florida is hot, humid, and muggy almost year-round. Make sure you have a plan in place to stay cool in your RV, whether it’s hookups, propane-power, or a generator. Save money by visiting Disney World during the fall and winter months. The summer months are the worst time to visit Disney World because that’s when everyone from around the world wants to visit Epcot. If you want to pull right up to Disney World, you can choose to camp inside the Magic Kingdom. 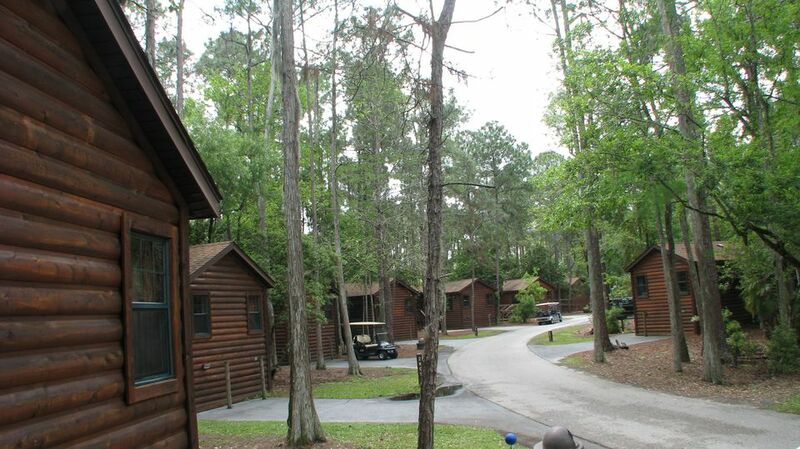 Disney provides 750 acres of campground and hundreds of spaces at their Fort Wilderness Resort. Fort Wilderness has all the amenities you would expect from an RV resort such as laundry facilities, full hookups, and a myriad of other guest services. You also get many services that are unique to Disney, such as childcare facilities and shuttles to different areas of the park. Rates for RV sites start at $82.00 a night for a full hook-up, 10 x 50-foot site, and up to $99 for a premium, 18 x 60-foot site although these prices can fluctuate based on season and demand. Unfortunately, your site does not come with any additional park perks, though the rates for being within park boundaries are very fair. Though these large RV spaces can accommodate up to ten guests, there’s also plenty to do outside of your space. You’re inside Disney World after all so you can expect plenty of great family-friendly activities at Fort Wilderness including horseback riding, canoeing, or cooling off at one of the many pools. If that’s not enough for you, there’s archery lessons, fishing, pony rides, wagon rides, and several types of recreational rentals. If the kids somehow still have energy after a day in the park, there are over a dozen ways to keep having fun inside Fort Wilderness. There are also seven locations places to grab food including everything from BBQ to a rustic restaurant with “old west” delights. When you camp at Fort Wilderness, you’ll never have to leave park boundaries for food, fun, or a place to stay. Pro Tip: Disney World provides a variety of transportation options for RVers, campers, and travelers in the area. If you stay at an RV park hosted by Disney World, you’ll have access to these transportation options and will avoid renting a car. If you plan to be at Disney World for several nights, then the price might seem a little steep for you. Luckily, there are several sites available in the nearby Kissimmee or Orlando areas. These sites will have all the amenities you need and are only a short drive to not only Disney World but Universal Studios and Legoland as well. By choosing a site outside of the resort, you will not only save on nightly rates but also be able to save money on dining and shop for necessities. Parks outside the resort tend to be less busy, so you’re better able to enjoy quiet nights after long days. It also a better way to restock on supplies, skirt around resort traffic, and enjoy the other activities built in Central Florida. If you want to stay out of the fray of Disney World itself, staying outside the park can be an excellent way to give your family a taste of everything Florida has to offer, not just Disney World. The Orlando/Kissimmee KOA provides everything you’d expect from a KOA, along with giving you discount codes for Disney World, Sea World, or Universal Studios admission. Patio, pull-through, and back in sites are available for rigs up to 134’ long. With a playground, gym, and Kamp K9 dog park, you’re a hop, skip, and jump away from relaxing after a long day roaming the Magic Kingdom. It’s only a 20-minute drive from here to Disney World’s front gate. Tropical Palms RV Resort sits on 69+ acres of open space for RVers and campers alike. In order 20 minutes, you’ll be walking into Disney World enjoying a beautiful day under the sun. This is another pet-friendly destination, offering a full fitness center, restaurant, laundry facilities, and Wi-Fi for visitors. You can enjoy mini-golf, fishing, biking, and more surrounding the resort if you’re tired of the crowds at the amusement parks and destinations just a short drive away. Moss Park is a bit further away with a 40-minute drive awaiting Disney goers, but this Orange County-run park features boating, hiking, swimming, and more. Bordering Lake Mary Jane to the east and Lake Hart to the left, you’re surrounded by wilderness in what’s known as Florida’s busiest corridor. It’s recommended you make reservations at least 45-days in advance, especially during summer to get the right spot for your rig. Read More: Consider one of the five best RV parks in Florida for taking in everything The Sunshine State offers travelers from across the country when visiting Disney World. Disney World by itself is a magical place for families to create memories for a lifetime. Imagine going there by RV, seeing everything along the way, and having a family vacation that eclipses anything you can dream of in the Magic Kingdom.